It's well documented that I love Madara skincare, I even have an older in-depth spotlight post dedicated to all the products I had tried at the time here. Since then I've been using a couple of other products, two of which were these toners from their basic skincare line. I'm always looking for the perfect toner, it's my favourite skincare step. Whether it's a mist or one applied with a cotton pad, I always have a couple open and in use. Madara actually offers three toners from their basic line and I've ended up with two of them - one to balance and the other to offer a little moisture. The third is for oily skin and since having a baby my skin is anything but oily! It's actually been super dry and I'm struggling to adjust as I don't really know what works for me anymore! I've just been layering on the moisturiser and hoping for the best! I purchased the Balancing Floral Toner (£14/200ml) first before my skin really started to get dry, and I found it to be great and very refreshing on the skin. The toner has a base of rose water to remain nice and gentle, but also contains lactic acid to gently exfoliate. It's also PH balanced to return your skin's PH to normal after cleansing and helps the skin absorb products applied afterwards. There's also Baltic raspberry, plantain, cucumber and chamomile in there for their added nourishment, balancing and calming properties. 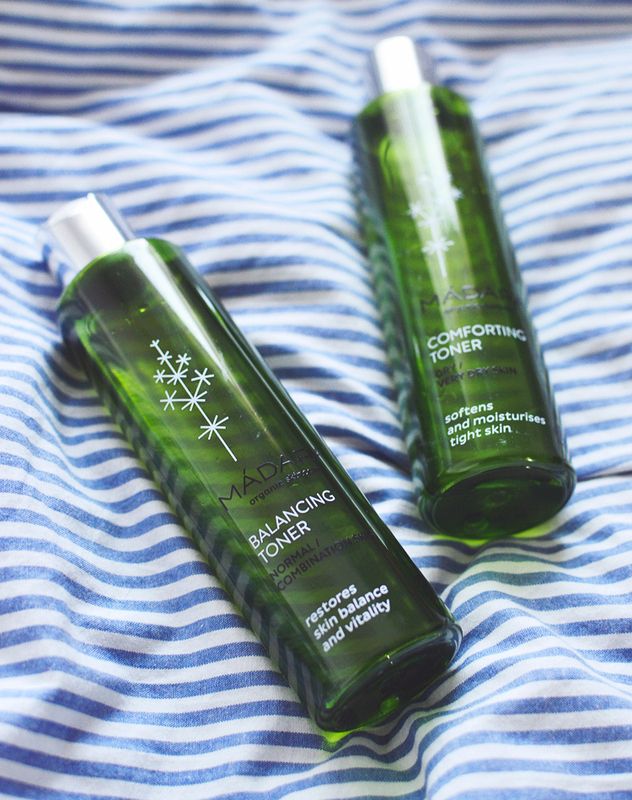 The Comforting Toner (£14/200ml) is very similar, but with fewer ingredients making it more suitable for sensitive skin. Rose water, chamomile and glycerin make up the bulk of the ingredients here to soothe and hydrate dry skin. I do notice a difference using this compared to the balancing toner recently, especially if my skin is looking flaky and very dry. I apply this to a cotton pad and press the toner into the skin with the pad, then move it in circular motions to gently scrub away any flaky bits. That's probably bad for my skin, but it seems to be a habit now. Both of these contain alcohol so if your skin is very sensitive I would say to give these a miss, but I've found them both to be very gentle indeed. In that first week or two after Oliver arrived, I barely had a moment or the energy to bother with skincare, and used quite a bit of micellar water to clean and followed up with the comforting toner (or Balancing & Comforting mixed together) on my skin to get rid of that typical icky feeling after using a cleansing water. And that's it. Who has time for moisturiser? (that's probably why my skin is so dry now, come to think of it, oops!). I remember my skin was pretty great in those early days from the lack of fussing over it - and I think the blood loss helped my complexion look clear for a bit ha! grim. So there we have it, as usual some more great products from Madara for your face. I think I'm obsessed? They have another toner available as part of the Time Miracle range that comes as a mist and sounds gorgeous, so you know that's on my list to try soon! Are you a fan of Madara?